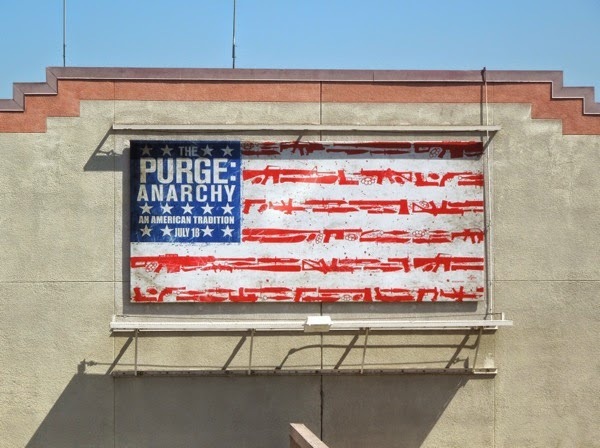 Imagine an America where once a year for 12 hours all crime is legal and all emergency services, police, fire stations and hospitals, are suspended for the night. 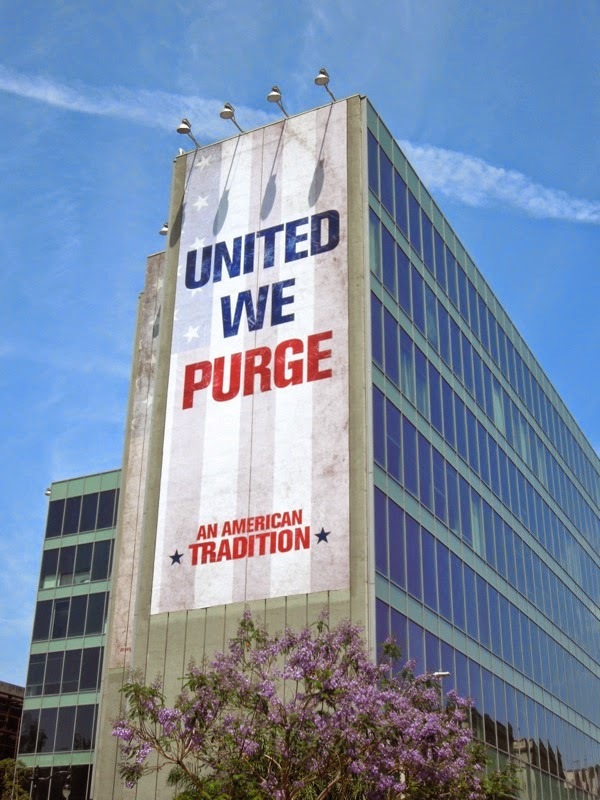 That was the nightmare scenario of 2013's The Purge which certainly captivated cinema goers and led to a sequel to the low-budget horror movie being fast-tracked for this Summer. 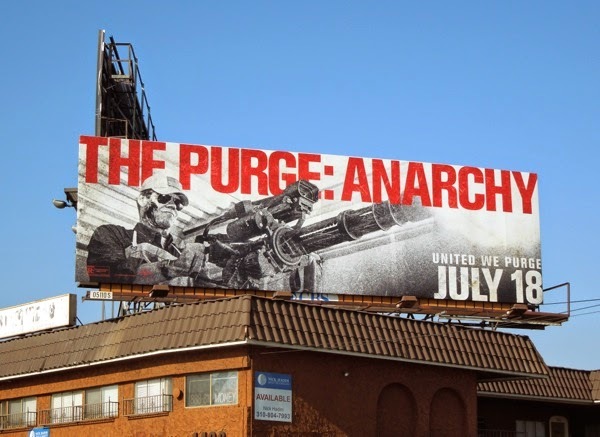 The Purge: Anarchy is once again written and directed by James DeMonaco, but whereas the first movie had a home invasion feel which followed the plight of a family under siege by a gang of knife and gun wielding psychos (also known as their neighbours), this new slice of horror takes to the streets of L.A. to experience the deadly night firsthand, once only glimpsed on television screens. 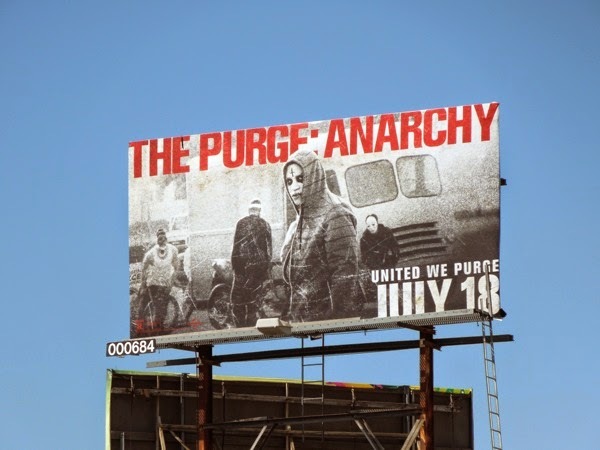 Zach Gilford and Kiele Sanchez are a couple driving home when their car breaks down just as the Purge begins and must survive masked marauders on motorcycles with murder in mind, whilst Frank Grillo is a man is out for revenge for the slaughter of his son. 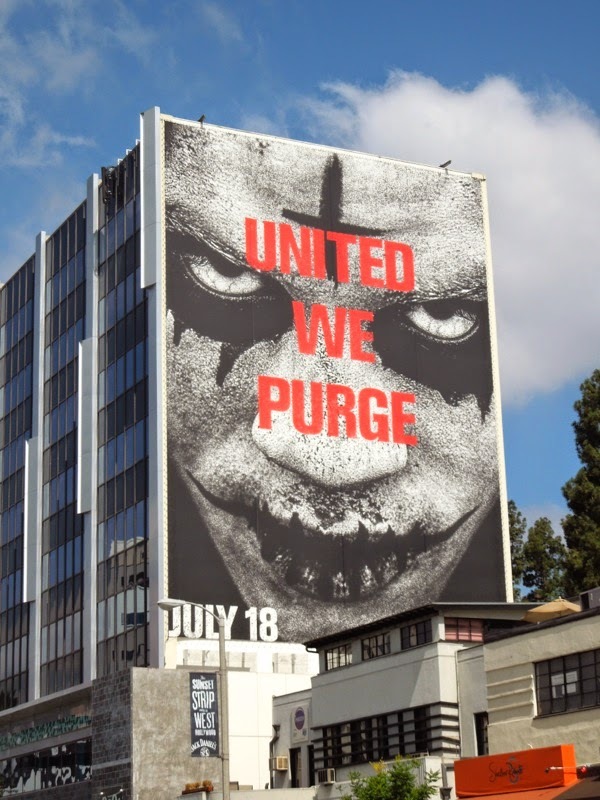 You just know it's not going to end well and not everyone will make it through the night unscathed as they all encounter more deranged participants. 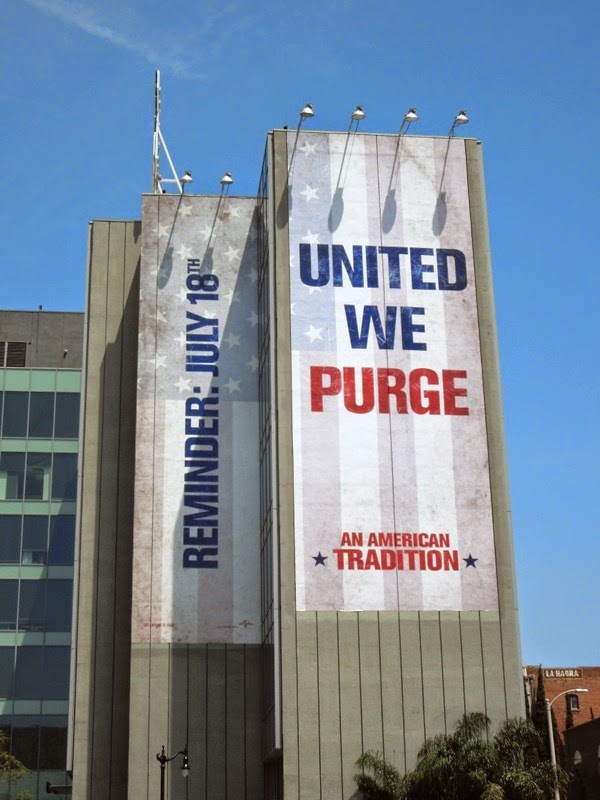 This patriotic new ad campaign reinforces the idea that The Purge is good for the nation, a chance to exorcise all those violent impulses and deviant desires, united under one purpose. 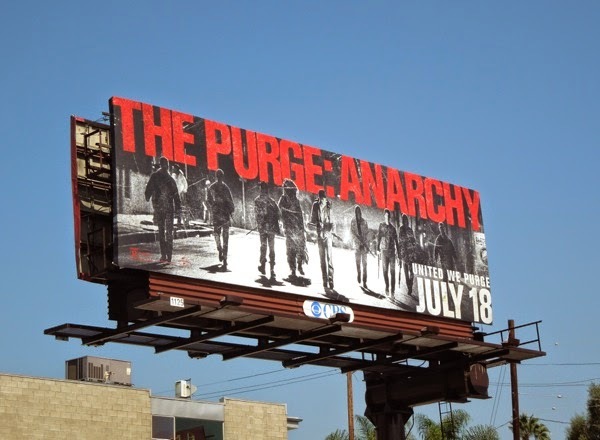 These giant-sized billboards for The Purge: Anarchy were snapped at the busy intersection of Highland and Franklin Avenues in Hollywood on May 18, whilst the clever American flag teaser creative, where the stripes are made of guns and assorted weapons, was spotted in the Lower Lot of Universal Studios Hollywood theme park on April 15, 2014. 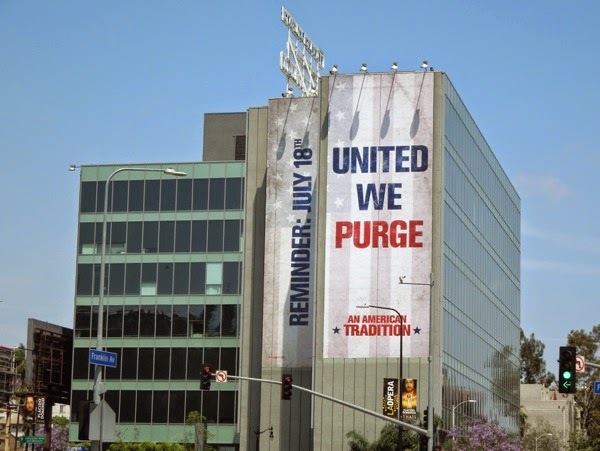 If you like these ads for the horror sequel, be sure to also take a look at the viral emergency services billboard campaign for The Purge from last year in L.A., plus a glimpse at how differently the film was marketed in the U.K. (which was much more of a traditional horror movie approach). 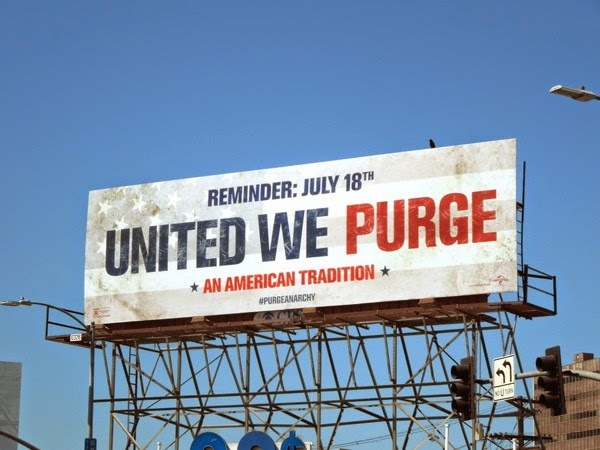 From the looks of these billboards it's time to bring out the big guns and remember all the good The Purge does. 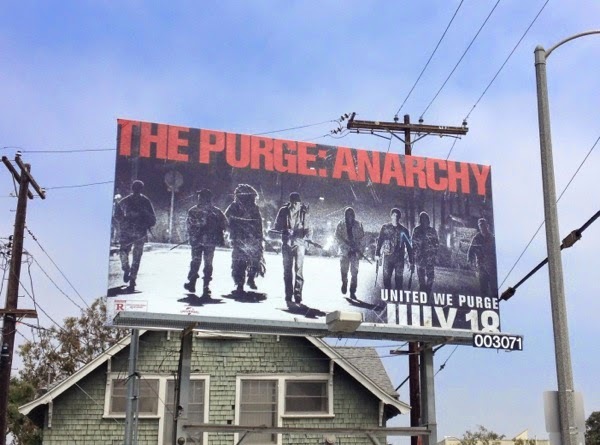 Let the slaughter commence. 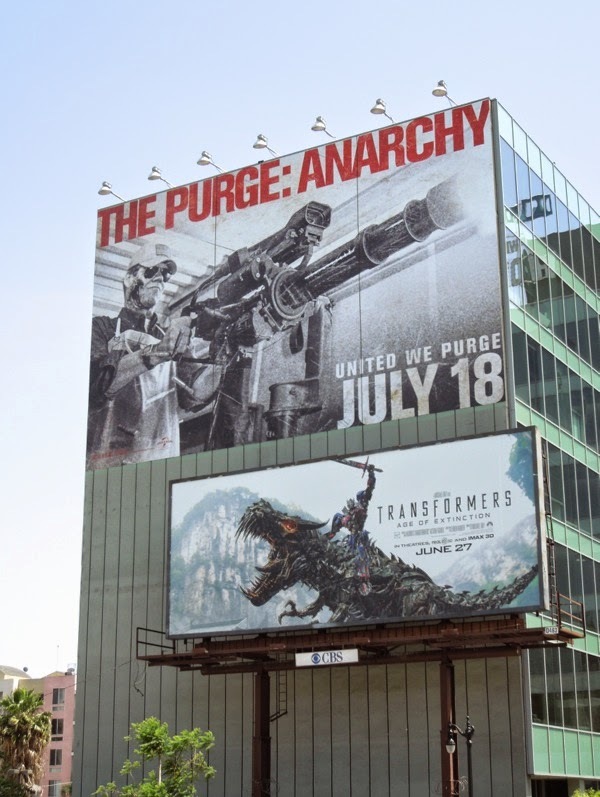 UPDATED: Here's another shot of the giant machine gun ad creative in better lighting, snapped on June 22, 2014. 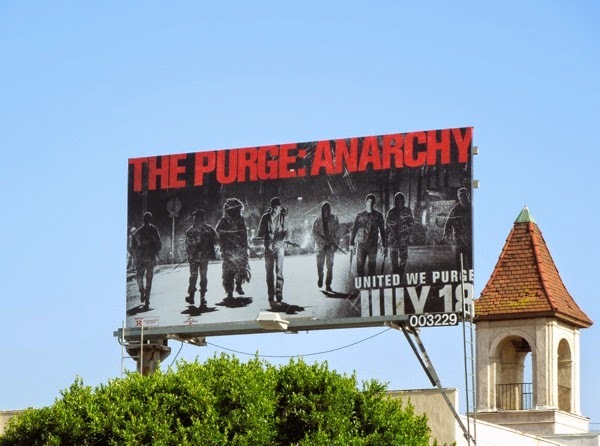 Plus here's a different creative focusing on the participants of The Purge, spotted near the beach in Venice on June 24, 2014. 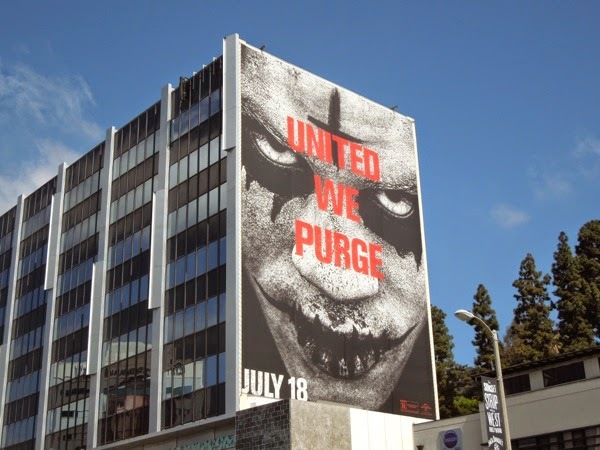 UPDATED: Now here's a face you wouldn't like to bump into on a dark scary night, let alone on the night of the annual Purge. 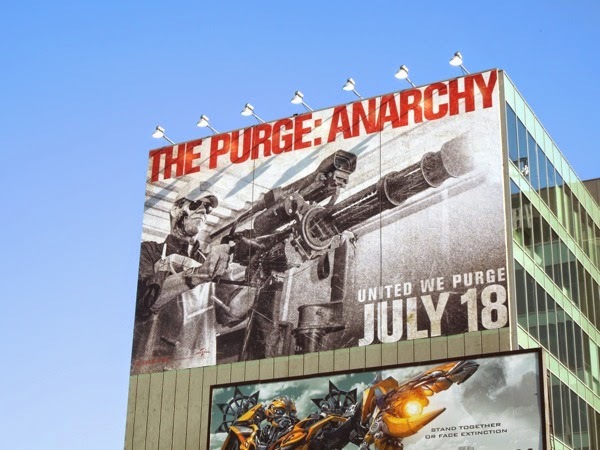 This menacing malcontent obviously has murder on his mind along with his delinquent friends, who come bearing flame-throwers and machine guns. 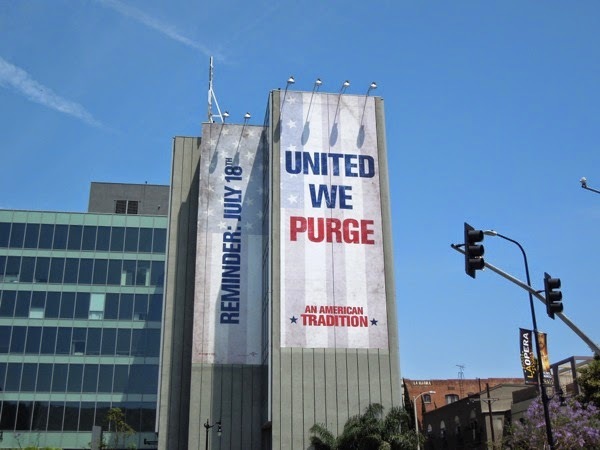 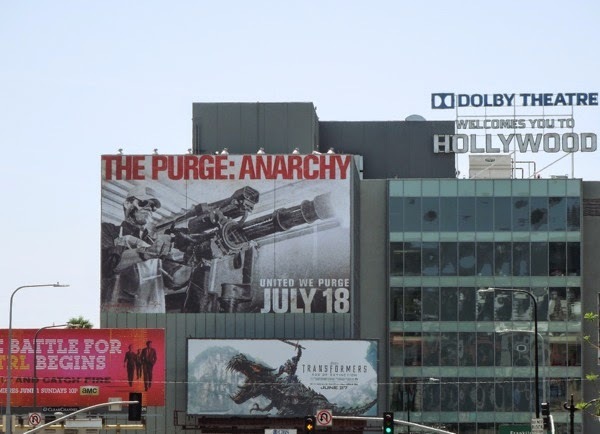 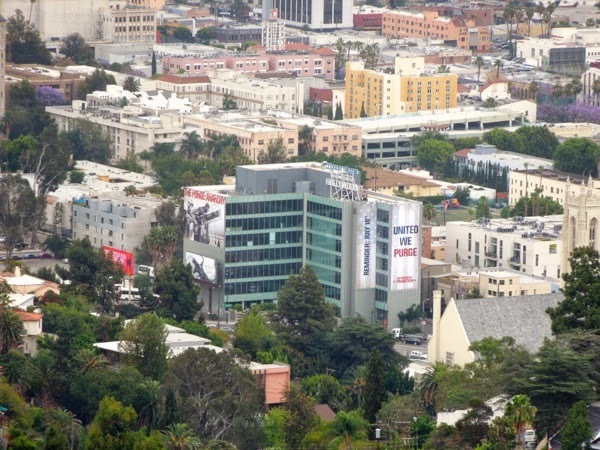 This foreboding giant-sized 'United We Purge' billboard was spied along L.A.'s Sunset Strip on June 27, whilst another of the street gang ad creatives was spied along Robertson Boulevard and a standard landscape version of the machine gunner along La Cienega Boulevard days before. 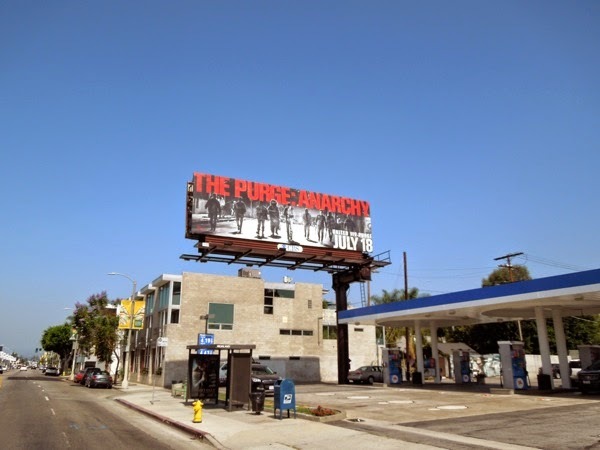 UPDATED: Meanwhile here's a larger version of the 'street gang' creative spotted looking menacing along Melrose Avenue on July 9, 2014. 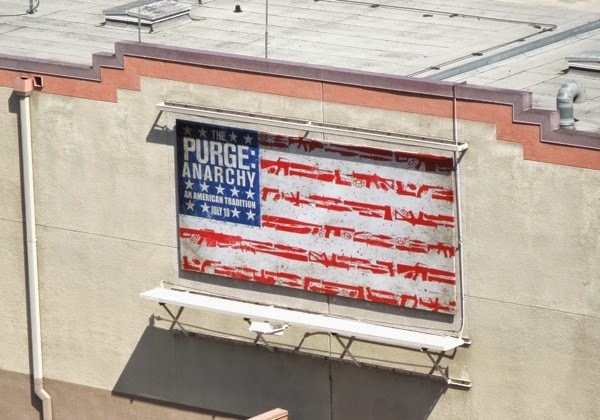 Plus here's a landscape version of the distressed patriotic U.S. flag and reminder of The Purge, spied along Fairfax Avenue. 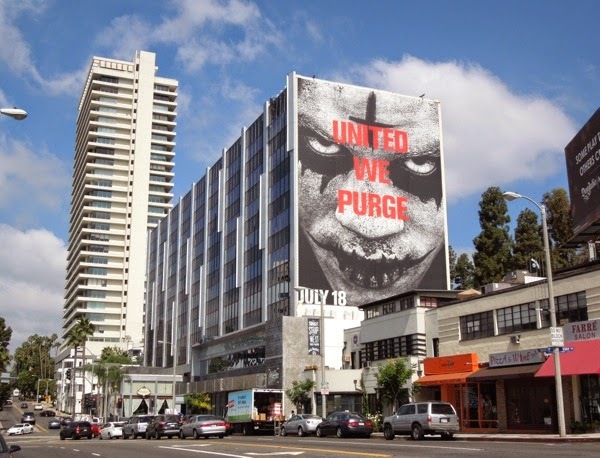 And another creative featuring the skull-faced hoodie-wearer spotted along La Brea Avenue on July 11, 2014. 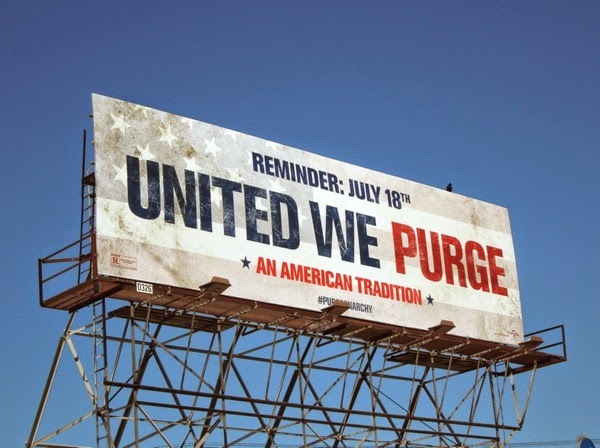 It's almost time for the nation to Purge once again and for anarchy to reign.